Working distracts me infinitely better than anything else. that might possibly be the remedy. 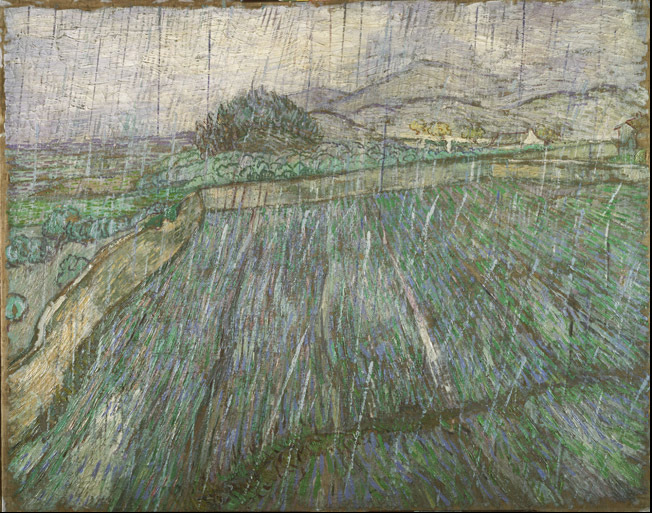 On a carefully planned April day of Art and Baseball in the big city, I had an opportunity to attend the Philadelphia Museum of Art's exhibition, Van Gogh Up Close. A feast for the eyes doesn't begin to describe it. The image above is a poor reproduction of the original painting, which is composed of chunky, luminous brushstrokes that tempts you to run your fingers over them. How Van Gogh depicted the arrangement of seeds inside the sunflower through the subtlest of markings amazed me, and it's something you can only appreciate standing in front of the painting itself, close enough to take in the detail, but not so close the museum guard yanks you back like a hooked trout. 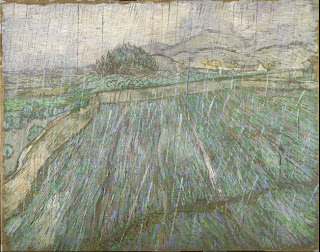 From outside of his room at the Saint-Paul clinic, Van Gogh was able to capture a field bombarded by a passing storm despite the bars covering his bedroom window. What impressed me most about this piece was that it really looks like a storm. So many storm paintings attempt to bring power to the clouds and water with color and contrast, making them too bright. The above image is an accurate portrayal of a dreary day where you can almost hear the rumble of thunder and the constant pattering of raindrops on the ground and the building. You can even make out the accumulation of water into glistening puddles. The exhibit was a further reminder that no matter how good a print job or digital capture is done, you cannot experience a painting fully, with all its personality and imperfections, unless you meet it in person. There are colors that can never be conveyed by anything other than the human eye. So many other paintings called to me in the exhibition rooms. I did what I usually do: wandered around like a lost drunk, gazing at some for several minutes, then running back to others that had stuck in my mind. I tried to exit several times, only to be stopped by the urge to make another round, all the while sending my love and gratitude to the artist. After making it out the exit, I was immediately bombarded by the commercial inspiration of Van Gogh's work through the vast variety of overpriced items in the gift shop. Prints, bags, umbrellas, games, shirts, scarves, mugs, magnets, and so on. What do you think, Vinny? Thousands of dollars gleaned from paintings that people in your lifetime didn't give a damn about. You only sold one painting. These folks are making a fortune. The most painful offerings were the holographic bookmarks. Gag. That being said, a magnet of Two Cut Sunflowers graces my refrigerator, and the accompanying coffee table book for the show lies on my ottoman. An art teacher of mine once told of how someone had said that an artist must suffer in order to create. My teacher had scoffed at this, only to change his mind later on. I, too, did not embrace the notion that pain was necessary for an artist. It seemed like a dismal future for anyone who embraced a creative career. But, the years have taught me different. When we create, we enter a new world, away from the one that is the source of the pain. For a little while, the brushstrokes, or chords, or words, or whatever becomes the reason to exist. The relationship to the medium is the only one that matters, and it's a relationship that gives far more comfort, sometimes, than those with the situations and people in our lives. Van Gogh seemed to feel that keenly, as suggested by the above quote. If the universe gave us the pain of our self-awareness, it was at least thoughtful enough to also give us a wonderful form of escape that can still be shared with others.